To be nominated for this Award was not just a big surprise for me, I see this also as a honor and glory for my work. I would say it’s not so a big thing this script and it isn’t rocket science. Dear GeekSpeak Tonight audience, please check out my PVS Health Check Script and provide me feedback if you want. Also have a look to my XenApp / XenDesktop Script. At this place I want to say thank you to Jason Poyner who gave me the idea for such kind of Script with his XenApp6 HealthCheck and where I took some code lines for the HTML output. To Martin Hartmann who helped me by learning PowerShell and of course to Aaron Parker (http://stealthpuppy.com) who was the assigned CTP helping me polish off my presentation materials. 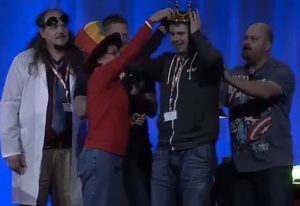 I won the competition and seems that I’m the not-yet-known Geek #1 this Year! Thanks you all! When I saw the work from to other two guys, I had the feeling to have no chance, not just because I’m the only not-native english speaker. David Ott with a great PowerShell script to modify the user profile and Shane O’Neil with the C-Sharp code to have a self healing VDI, GREAT! I’m sure I also had luck to win, and now I have the chance to go to Las Vegas Citrix Synergy 2016. I also want to thank ControlUp for the AppleWatch they sponsored for the GeekOvation Winner. I’m currently working on a Script which shows PVS retries during a variable timeframe (day, week or month) and create a graphic output, in this way you can see at which time you maybe have a traffic jam on your network. I also made a script to export/import target’s into PVS and another one for export and import in XenDesktop, if I have time I’ll polish and publish this here. Congrats Sacha! Nice script. I’ve used it for a costumer and tweaked a bit so that all their stores are being scanned. Great work! Thnx. i’m glad to read that! How you’ve done it with more Stores? Just dublicated the code for the store? Do you like to share the tweaked script? Nice work Sasha! Community work should always be rewarded. You’re scripts are always part of my design and recommendations. That is awesome! Where can we grab David’s powershell script and Shane’s C-Sharp code? Yes, maybe I can help, but whats your need? Unfortunately there is no PoSh integration in CPS4, XenApp commands are only availible with XenApp5 as far as I know.